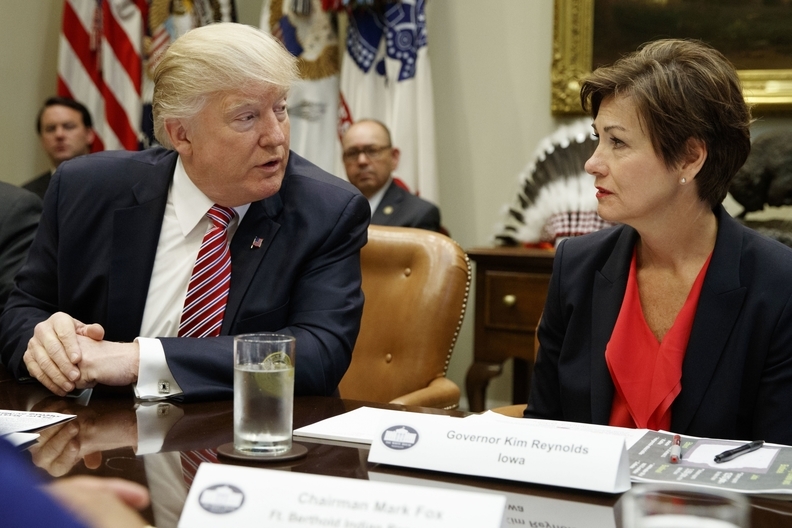 Iowa and Oklahoma are about to test the Trump administration's declared commitment to giving states greater leeway in establishing alternatives to the Affordable Care Act's insurance exchanges. Iowa officials plan to submit a sweeping state innovation waiver request to the CMS next week that would substantially revamp the ACA premium tax credit model and use some of the federal subsidy money to set up a reinsurance program to protect insurers that sign up high-cost enrollees. They've already offered two drafts and had discussions with top CMS leaders. Iowa hopes the CMS will approve the waiver on an emergency basis because only one insurer has offered to sell ACA-compliant plans in the state for 2018. That insurer, Minnesota-based Medica, proposed this week to raise its rates by 57%. An Iowa Insurance Division spokesman said the state expects "quick approval" of its waiver from the CMS. On Wednesday, Oklahoma filed a waiver request, also under the ACA's Section 1332 state innovation waiver authority, to use federal subsidy money to fund a new reinsurance program, as the first step in a broader reform of the ACA coverage system. Like Iowa, Oklahoma wants to replace the federal insurance exchange with its own purchasing platform and modify income eligibility for premium subsidies. Unlike Iowa, it also wants to revise the ACA's essential benefits requirements. Oklahoma also has only one insurer currently selling ACA-compliant plans. Both states argue their initiatives are urgently needed to make premiums more affordable, attract more carriers into the individual insurance market, and persuade more healthy consumers to buy coverage. In its waiver proposal, Oklahoma said it "would like to work with the new administration to address persistent challenges related to consumer choice, competition and uncontrolled cost." The moves by the two Republican-led states follow last month's collapse of congressional GOP efforts to repeal and replace the ACA and give states greater leeway to design their own systems. Iowa, Oklahoma, and other states say that with the failure of Congress so far to take action to stabilize the individual insurance market, they need to implement their own reforms quickly. If approved, the two states' proposals would achieve some of the goals of the congressional GOP replacement bills by giving the states greater flexibility to set their own premium subsidy and insurance market rules. That leeway would include reducing assistance to lower-income consumers and increasing it for people with somewhat higher incomes. It's widely expected that if HHS gives Iowa and Oklahoma the green light on their ambitious redesigns, other states soon would follow with similar proposals. "I wouldn't be surprised in other states aren't already developing similar waiver requests," said Keith Mueller, interim dean of the University of Iowa College of Public Health. "How quickly other states would jump in depends on what whether Congress moves fairly quickly on market reforms." The CMS last month approved a 1332 waiver request from Alaska allowing that state to use federal subsidy money to fund an existing reinsurance program that previously was funded just with state money. As a result of that program, average premiums increased by only 7.3% this year. Minnesota has a similar waiver request pending to use federal pass-through funds along with state funds to create a new reinsurance program. Some Iowa insurers and providers are backing the so-called Iowa Stopgap Measure. Wellmark Blue Cross and Blue Shield said it would reverse its decision to exit Iowa's exchange market in 2018 if the waiver is approved. The Iowa Hospital Association said it supports the proposal "as a positive first step toward… putting the market on a more sustainable and effective path." Medica has taken no position on the waiver proposal. But experts who support the ACA say the Iowa proposal would make healthcare less affordable for lower-income people, would be hard to implement in time for the 2018 open enrollment period, and would be vulnerable to legal challenge under the ACA's Section 1332 requirements. "If Iowa gets this pass-through money, how will it get it back to people for the open enrollment starting in 10 weeks?" asked Karen Pollitz, a senior fellow at the Kaiser Family Foundation. "It's really late in the year to be looking at waivers for anything for 2018." There are questions about whether the Iowa plan complies with the ACA's four so-called guardrails for Section 1332 waivers. Those guardrails require state innovation waiver plans to cover at least as many people with benefits that are as affordable and comprehensive as offered by the ACA exchanges. In addition, waiver plans can't increase the federal deficit. Similar issues could arise about Oklahoma's later-stage proposals. "If I were someone in Iowa with an income of 450% of the federal poverty level, this would look pretty nice," said Tim Jost, an emeritus law professor at Washington and Lee University and an authority on the ACA. "But if I had income of 150% of poverty, I would be pretty concerned." In addition, some observers question why Iowa officials are not also proposing to discontinue plans that are not compliant with ACA rules, which could bring healthier people into the risk pool. The state says 85,000 Iowans are in non-compliant plans that predate the ACA, while only 72,000 are in the ACA-regulated market. That step alone could strengthen the state's market, though it would offer a one-time rate shock to members of non-compliant plans who currently pay lower premiums. "The whole idea of the ACA is to get everybody, healthy or sick, into the same pool to stabilize the premium and spread risk," said Michael Rozum, a benefits consultant with Benefit Solutions in Cedar Rapids, Iowa. "Keeping them separate is doing a disservice to the ACA." The office of Iowa Insurance Commissioner Doug Ommen declined an interview request. Under the Iowa Stopgap Measure, each insurer participating in the market would offer one standard silver-level plan, which consumers would buy directly from the insurer or from brokers. That would make it faster and easier for insurers and the state to implement the new system. People would receive premium subsidies based on broad age and income categories, without using the ACA's calculation capping premium cost at a certain percentage of a person's income. The state revenue department would determine a person's eligibility and level of subsidy, rather than having that determination made by the federal exchange. For example, Iowans ages 45-54 earning 150% to 200% of poverty would receive a flat credit of $489 a month, while people of the same age group earning more than 400% of poverty would receive $65. The ACA cuts off eligibility for premium tax credits at 400% of poverty. People with incomes from 138% to 250% of poverty who enroll in silver plans would no longer receive cost-sharing subsidies to reduce their deductible and coinsurance payments. Meanwhile, the state would set up a reinsurance program to subsidize insurers for high-cost enrollees, providing 85% reinsurance for claims from $100,000 to $3 million and 100% reinsurance for claims exceeding $3 million. The state says the reinsurance program would bring down premiums and make coverage more affordable for everyone. But critics say eliminating the cost-sharing subsidies would make it too expensive for lower-income people to seek medical care, because typical silver plans carry annual deductibles in the range of $3,500, plus coinsurance. The cost-sharing reductions can reduce the deductible for lower-income people to around $200. "That becomes a real barrier for low-income people," Pollitz said. "They can't afford to go to the doctor or fill a prescription." Iowa would pay for its new system of premium subsidies and reinsurance by collecting the federal premium tax credits and cost-sharing reduction payments its residents and insurers would otherwise receive in 2018. That's called pass-through funding. An actuarial study commissioned by the state projected that Iowa would receive nearly $400 million in federal premium tax credits in 2018. The study did not calculate any figure for cost-sharing reduction payments because the Trump administration has threatened to terminate those payments to insurers. Iowa healthcare providers are concerned about whether the state's waiver plan would deliver affordable coverage and care for residents, particularly with the elimination of the cost-sharing subsidies. But they feel something needs to be done soon given the precarious situation of having only one insurer selling plans. They fear many Iowans, facing 40% to 50% premium hikes, will drop coverage and that uncompensated care costs will spike. "It's definitely not perfect," said Sabra Rosener, vice president of government relations at UnityPoint Health, a West Des Moines-based health system. "But it's better than the alternative."